Located in the heart of downtown Libertyville, IL, we welcome you to take advantage of all we have to offer. Our growing, departmentalized staff, is dedicated to continued education, in all aspects of the business. Complimenting your style and personality with your color and/or cut is emphasized to give you the look you desire. We guarantee to provide you with a warm, friendly atmosphere. We want you to relax and feel at home while you are visiting with us. 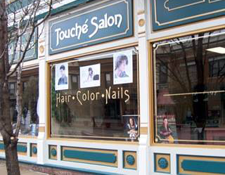 We believe when you are here, it is all about you – so enjoy the duration of your time and your experience withus at Touche Salon. Remember Valentines Day. Give the man in your life the gift of grooming. Buy any 4 travel size hair products and receive a free cosmetic bag!